NES on the fritz? Game Boy bashed and broken? That's fine. Renegade Kid loves kicking it old school. Eventually, what's old becomes new again, and this is especially true with video games. The industry survived its love affair with polygons, back when it seemed like 2D would get kicked to the proverbial curb. Then, a renaissance, which produced gems like Mega Man 9, Aliens: Infestation and Mighty Milky Way, modern day titles with retro charm. 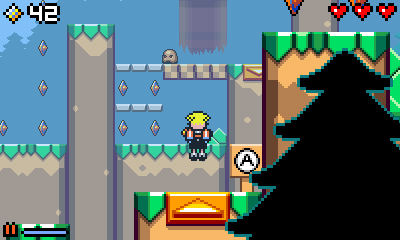 That said, we can't help but love everything about Mutant Mudds, an upcoming 3DS eShop game from Renegade Kid, the same developer behind the super violent DS adventure, Dementium: The Ward. Just don't confuse this title with the aforementioned survival horror romp. No, this one is appropriate for all ages, and thus far, looks quite enjoyable. The game's a 2D platformer complete with sprites, the kind you normally see on the Nintendo Entertainment System (NES). You play as Max, a blonde glasses wearing youngster who sets off (literally from his house) to squash the Mutant Mudd army, a collection of dastardly creatures with names like Skeyes, Bricksworth and Sacky Sit-Sit. Don't lie. You love it already. Armed with a powerful water cannon and an equally effective H2O fueled jetpack, perhaps a homage to Nintendo's own Super Mario Sunshine, Max explores five unique worlds comprised of 40 increasingly difficult levels, blasting bad guys and picking up Golden Diamonds (1600 total) along the way; he must also locate 16 Water Sprites. Why diamonds? Because that's what Max's grandma loves the most. Well, next to her grandson, that is. You'll be able to cash in this loot while inside her shop, acquiring three power-ups, though you can only equip one at a time. 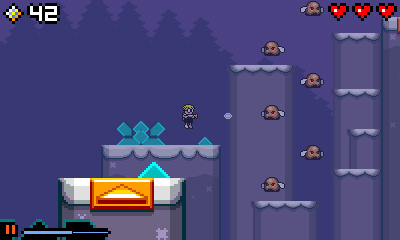 What makes Mutant Mudds especially cool is the ability to jump between planes. In other words, you can leap from one side of the stage to the other, which the developers display in the background at all times. Must look great in 3D. 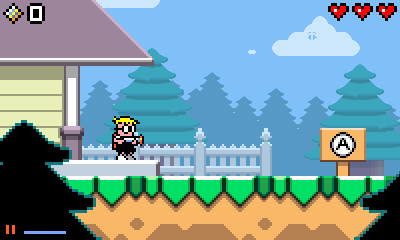 From the looks of it, Mutant Mudds should be a great addition to our 3DS downloadable library when it debuts sometime this month/early 2012. We'll let you know if this retro inspired effort makes the grade in the (hopefully) near future.